The most reliable prognostic factors associated with Upper Extremity (UE) recovery are localized motor impairments, especially in the musculature of the hand and abduction of the shoulder in the first days after a stroke. Evaluation of the biomechanics of the hand allows an accurate identification of the motion arcs of the digital joints. Objective: Assess the prognostic value of the range of motion of the finger joints using an instrumental glove (CyberGlove II®) one week after stroke for UE functional recovery at 6 months. Methodology: A prospective, longitudinal, observational study with follow-ups at 3-4 days, 1 week, 3 and 6months of patients with UE motor impairment. Variables collected included: demographic data, level of stroke severity (NIHSS), deep sensitivity, sphincter incontinence, Fugl Meyer Assessment of UE (FM-UE), muscle balance with the Medical Research Council (MRC), muscle tone (Modified Ashworth Scale) and pre- and post-stroke functional ability (Barthel Index and Modified Rankin Scale). Active range of motion of the metacarpophalangeal and interphalangeal joints of the index, middle finger, annulary, and little finger was assessed with CyberGlove II® without and against gravity. The dependent variable UE function was evaluated with the Action Research Arm Test (ARAT) categorized as good function (ARAT=10) and poor function (ARAT<10). Results: 31 patients were included, 18 of which completed the 6-month follow-up. Mean age was 68.2 years (SD = 9.1) and 72.2 % were men. A total of 77.8 % of strokes were ischemic, and 50 % of these were lacunar. Mean NIHSS score was 9.2 (SD = 5.5). Motor NIHSS of UE, FM-UE and MRC of the flexion-extension musculature of the digits and wrist were prognostic factors for the recovery of UE function. 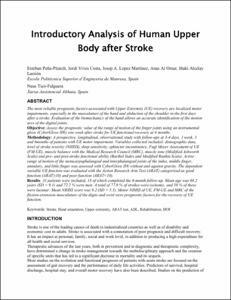 Peña-Pitarch, E., Vives, J., Lopez, J.A., A. Al Omar, Alcelay, J. I., Ticó, N. Introductory analysis of human upper body after stroke. " International Journal of Privacy and Health Information Management", Gener 2019, vol. 7, núm. 1, p. 1-16.